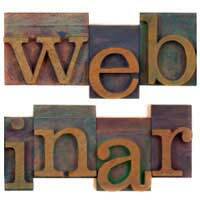 A webinar is a live meeting, seminar or presentation conducted on the Internet. The audience pre-book the webinar and log in to their computers at home or work at an agreed time. Ideally, an audience should be sitting in front of their computers before a webinar is due to begin. To ensure this, ask everyone to log in at least two minutes before the speaker appears. Other slides should also build interest by displaying relevant quotes from the speaker. A good webinar speaker doesn’t begin by introducing him or herself. Instead, the speaker should hook the audience into the webinar with a challenging statement or unusual statistic. The aim is to engage the audience from the very first words. Only then should the speaker say who he or she is. Keep this introduction brief. Don’t linger on experience and qualifications. What the audience really want to know about the webinar is what they will get from it. Address this point by saying how the webinar will benefit the audience. Also explain how long the webinar will last and when the audience can ask questions. Use lots of colourful slides throughout a webinar. Slides keep an audience interested. Watching a speaker, no matter how good he or she is, can become dull. Don’t fill the slides with words. Keep text as concise as possible. Don’t display rows of bullet points, for example. Have no more than one bullet point per slide. This helps the audience consider each point thoroughly. A speaker should make as few references to him or herself as possible. Instead, it is more effective to refer to the audience and use the word “you”. Don’t, for example, say, ‘I am now going to explain how to sell this product to consumers’. Reword such a sentence as follows: ‘You will now discover how you can sell this product to consumers’. Stop at appropriate points and ask for questions. This prompts the audience to interact. Don’t be vague or pause unnecessarily. Don’t stumble over words. The way to avoid these problems is to write a structure for the webinar and rehearse. Include stories and memorable quotes. If the stories are funny, so much the better. An audience will remember these. Vary the pace. Variety keeps an audience interested. A steady tone becomes monotonous and boring. At the end of a webinar, summarise what has gone before and clarify any complex issues. Also ensure the audience knows what to do next. Don’t leave the audience in any doubt. Finally, think of a relevant and original quote to use before signing off. Such a quote will stay in the audience’s minds and seal the webinar’s success.